This is not a recipe of mine, I took this recipe from Fernanda’s blog Sabor Brasil. The original cake is this: Bolo gostoso com cobertura de coco, if you look at the photos you can see that the result is totally different, I took a cake and turned it into little and funny volcanoes. I think that the best way to pay homage to a recipe is to give your interpretation, so I’m giving mine! I promised myself to not change too much this brazilian cake, but I could not resist. 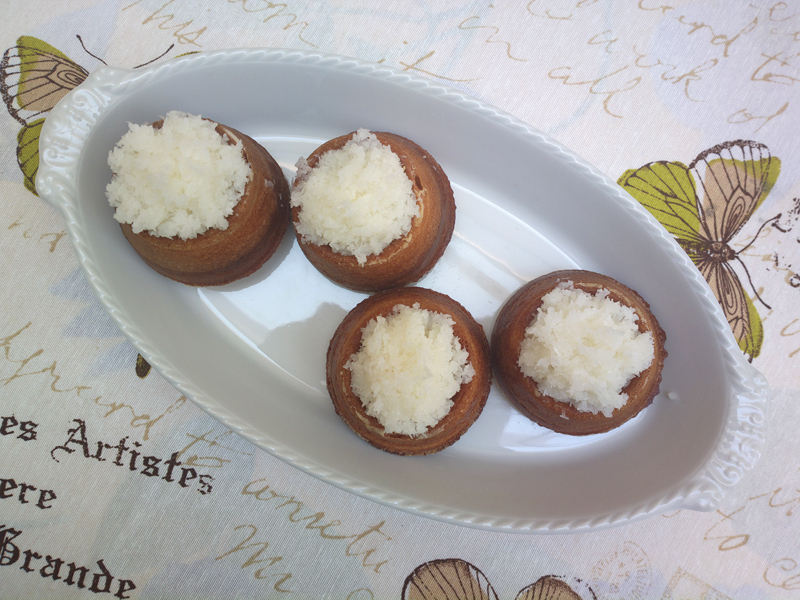 I added lemon and vanilla, to adapt it to the italian taste, I changed butter with margarine, I used two eggs instead of three. ok, I must admit, I changed a lot of things, including the shape of the original cake, thing that made this little cakes really funny! 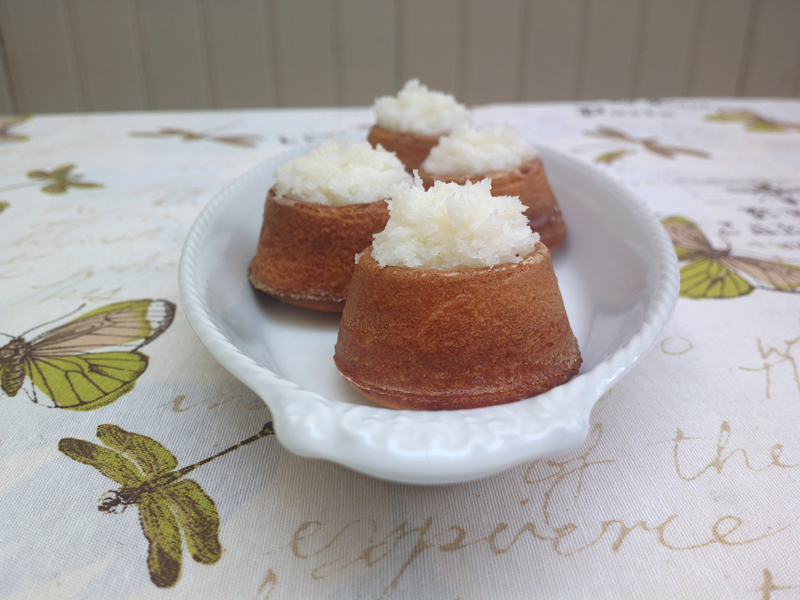 I used little bundt moulds with a flat top (a sort of sweet crater), where I put the coconut, they really look like mini-volcanoes which erupt white and delicious lava. 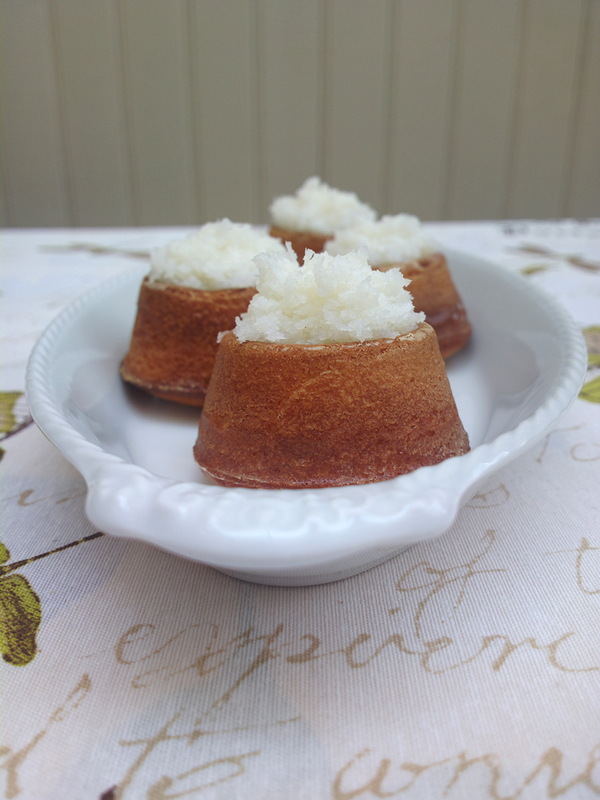 The biggest change that I made from the original recipe is probably the coconut surface/covering. I reduced the quantity of milk and increased the quantity of coconut so the mixture could be wet but not too much. The original recipe suggested to serve the cake inside of a baking pan because the cake should be really wet. 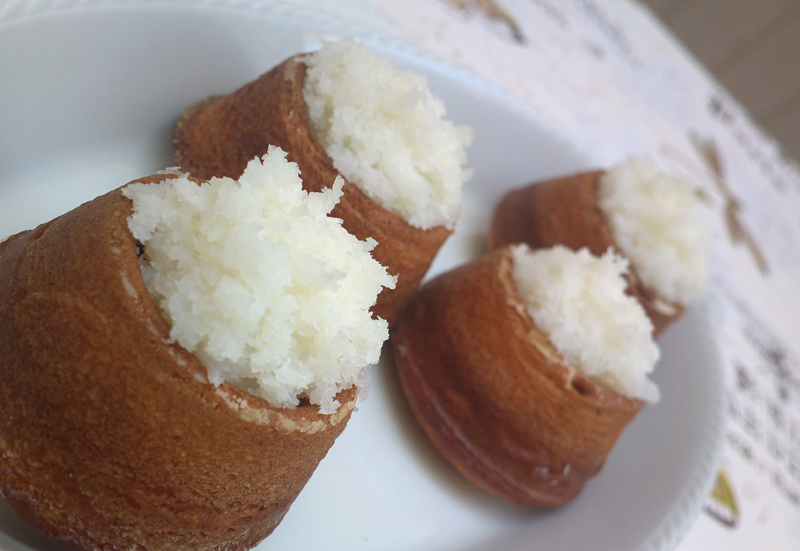 This is of course wasn’t possibile with pastries, that’s why I changed the covering. I really liked these mini-vulcanoes. 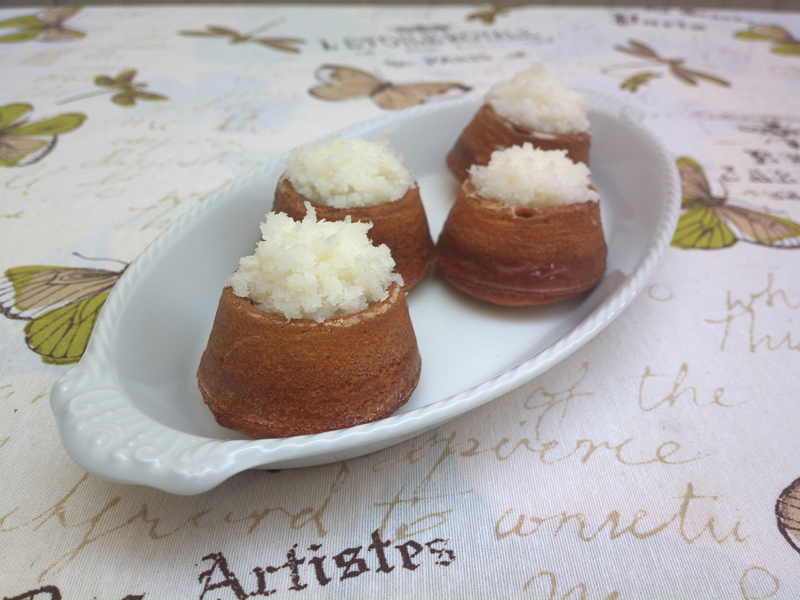 They have a different shape from the classic muffin/donuts/bundt cakes, and they also have an interesting taste. The cake itself is soft and light (only 50 gr of butter or margarina for 18 cakes) , the filling is sweet, mellow and crunchy at the same time. 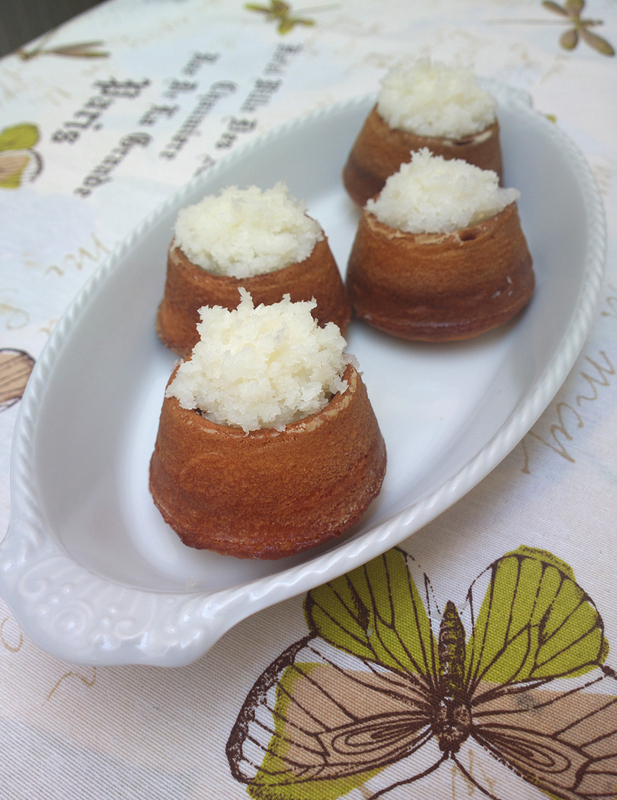 Melt butter or margarine using a microwave. Add milk to cool it down. Beat the eggs with sugar until they are pale and foamy. Then add the mix of milk and butter to the eggs, slowly and still beating. Put also salt, lemon zest, vanilla, and then flour mixed with baking powder. You will have a quite liquid dough, don’t worry. I used a baking tray with 6 bundt-shaped holes, and another one with 12 holes. I greased them and spilled the mixture inside each hole. I got 18 mini-volcanoes in all. Fill each hole at about 2/3 of its capacity, the dough will rise a lot. Place inside a preheated oven (180°) for about 18/20 minutes, until the surface is golden. In the meanwhile prepare the covering. 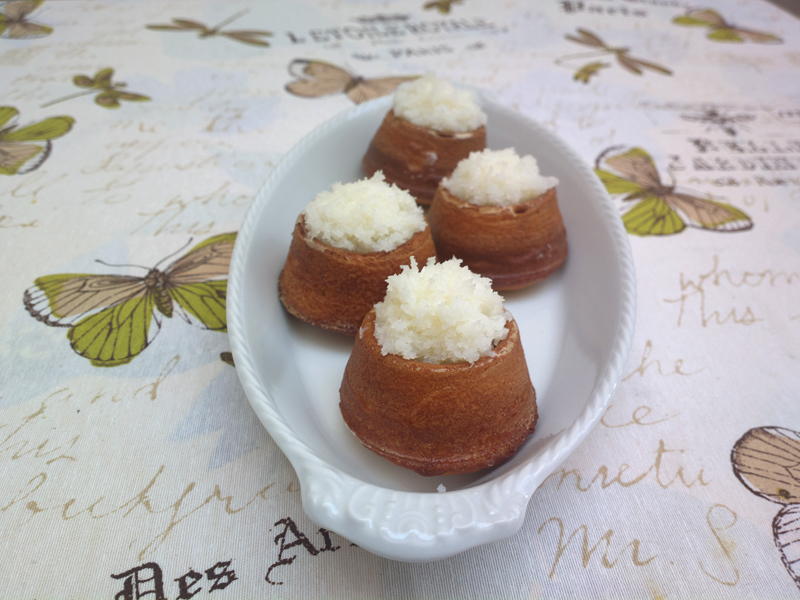 In a bowl put the coconut, sugar and milk and mix them well until the sugar is melted and the coconut rehydrated. 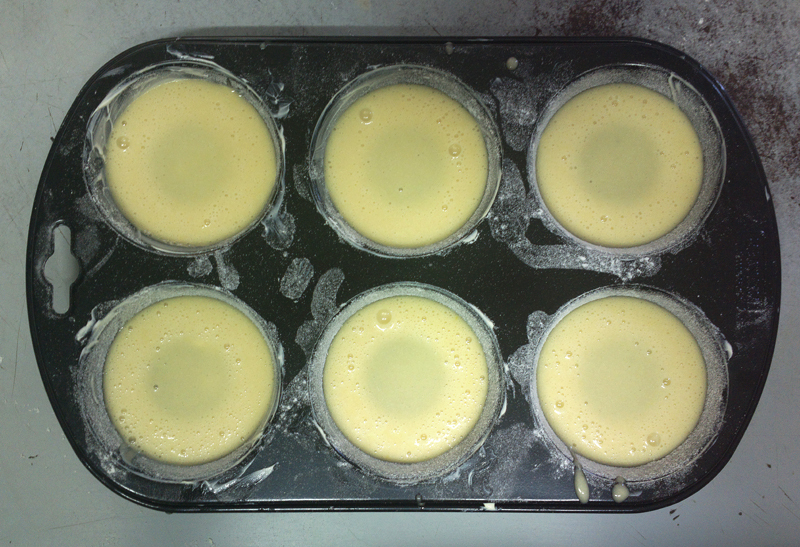 When the cakes are baked, wait 5 minutes to take them out of the tray, then wait them to cool and put the covering inside the holes. Serve quite immediately, because the filling is a little wet. maledetto blog che non mi notifica una ceppa niente!!! quando uno ha commentato la prima volta addio…poi lui va in automatico, e non ti avvisa più! no guarda, sti cosetti, vucanetti, dolcetti, montagnette, chiamali come vuoi, sono stati una scoperta!!! sono buonissimi! e rinfrescanti al massimo, la copertura è qualcosa di divino!